Before diving into the different phases of the compiler, it would be helpful to set out our overall goals and the context which the compilation process fits in. 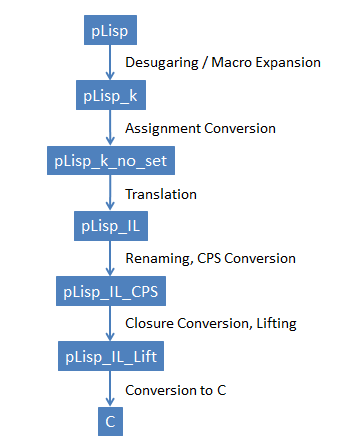 Not every transformation results in a new dialect; for example, both the input and output of the renaming transformation are in the 'pLisp_IL' dialect. The 'k' stands for 'kernel', as in the core language we're left with once all the macros have been expanded/desugared. A new construct 'let1' that desugars to 'let'. Functionally 'let1' is identical to Common Lisp's 'let*', but since our parser doesn't handle '*', we go with 'let1'. pLisp_IL_CPS is the continuation-passing version of pLisp. I'll explain this in more detail when I talk about CPS conversion; for now, note two important constraints: a) 'let' forms will have only one binding and b) there are also restrictions on what can be 'lettable' expressions. pLisp_IL_Lift continues with the simplification further: the only forms permitted on the right hand sides of binding expressions in 'let' are variables, literals and primitive applications (also, the only permitted arguments to the primitive applications themselves are variables and literals). One form not included in these is 'define', used to create top-level forms. Strictly speaking, 'define' is handled outside the compilation process (though we need to call the compiler to compile and evaluate the expression whose computation should be mapped to the variable being defined). Subsequent posts will talk in detail about the different phases.